Sri Krishna Jayanthi is the celebration of Lord Krishna’s birthday which is also known as Janmashtami and Gokulashtami. The festival is celebrated on the eighth day (Ashtami) of the Krishna Paksha (dark fortnight) of the month of Avani (August–September) in the Tamil calendar. This festival is celebrated 8 days after avani avittam. 'Sri Vaishnavas' celebrate the festival on Rohini Nakshatram. SRI KRISHNA, the eighth avatar of Lord Vishnu on earth, symbolises the victory of good over evil. This festival is celebrated all over India with great enthusiasm and devotion, according to the various local traditions and rituals. People pray with full devotion and faith and go to Krishna temples and pray HIM. An event known as "Uriadi" in Tamil Nadu, and "Dahi Handi" in North India is celebrated in temples, where as earthen pot is filled with curd and tied high. Youngsters form a human tower and break the swinging pots. How to celebrate at home? On the previous day, clean the pooja items, lamps, idols if any. Apply chandan, kumkum to the idols, lamps, wick them and keep ready. Soak fistful of rice for 2,3 hours and grind to a fine paste. Dilute it to a semi- thick solution. 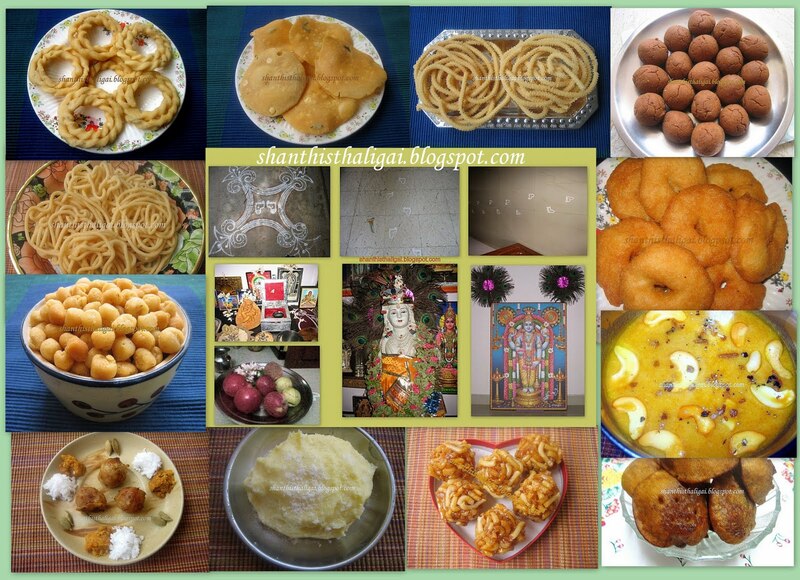 This batter is called 'izhai kolam maavu' which we make during festivals to put kolam. Mango leaves for thoran. Make thoran and keep ready. Flowers, Tulasi, fruits-all varieties (especially seasonal fruits like jamun(naavalpazham) guava, pear and wood apple(vilampazham), coconut, betel leaves, betel nuts, garlands. These will be available in plenty in the market on the previous day. You can shop for it. Also keep ready turmeric powder, kumkum, sandal powder, camphor, incense sticks, gingelly oil or ghee for lamp. These will always be available at home. If not, shop for it too. Put 'izhai kolam' in wooden planks. 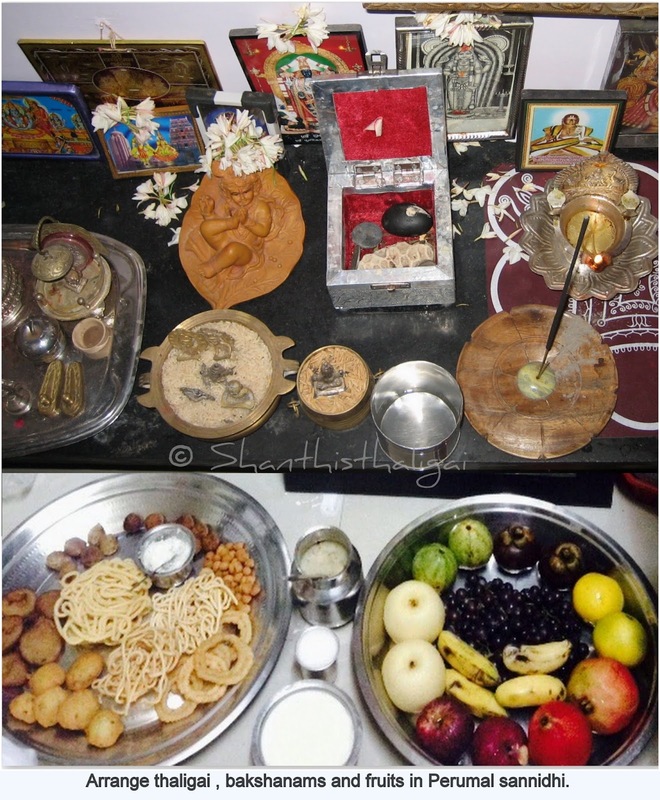 Things can be arranged according to the rituals done in one's home. However, even if one cannot afford to buy and celebrate in an elaborate manner, it is enough just to chant and pray with full devotion and faith. On the day of Sri Krishna Jayanthi, wash and put kolam in the frontyard. Take head bath early in the morning, wear clean clothes, clean the pooja room or the place where the idol is to be kept, put kolam on wooden planks, perumal sannidhi or raised platforms. Tie the mango leaves thoran on the main entrance. Decorate the idol. 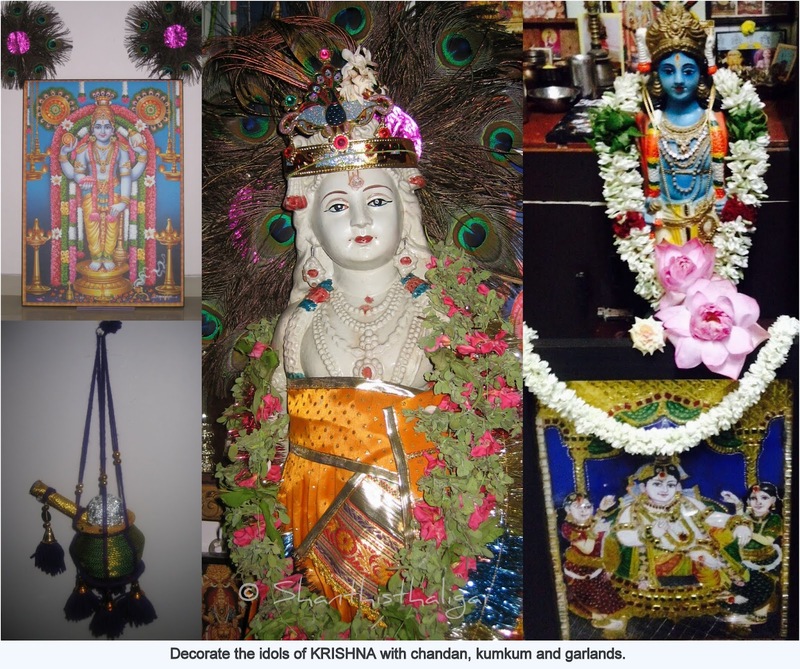 Decorate Krishna photos with chandan,kumkum and garlands. In some houses, the idol is given a bath with pure water and then decorated. Make all the offerings. (In some families, as many items are to be made as offerings, people make them the previous day itself after taking a head bath. However, these are consumed 'only after offering it to KRISHNA the next day'). 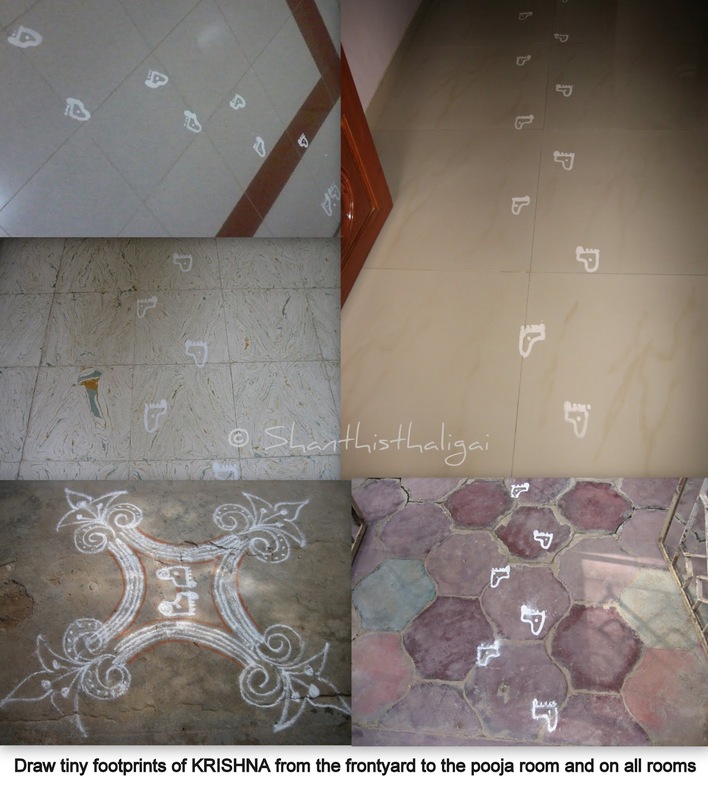 Draw tiny footprints of Lord Krishna - Krishnar kaal (with the izhai kolam maavu prepared as said above) from the frontyard of the home to the pooja room, which commemorates HIS birth. Usually, elders fast during the festival and make all offerings and youngsters draw kolam and 'Krishnar Thiruvadi' with rice flour paste. Wear nine yards saree. Arrange thaligai , bakshanams and fruits in Perumal sannidhi alongwith thamboolam. Oil and light the lamp. Pray to God by chanting mantras, and devotional songs. Tell any slokas on Krishna like Sri Mukundamala, Sri Gopala Vimsati, Geeta Govindam, Krishnashtakam, Madhurashtakam and do archana with flowers and Tulasi. Tulasi is Krishna's favourite and tulasi garland is considered important. Bhagawad Gita, Sri Narayaneeyam, Sri Vishnu Sahasranamam, and slokas can also be recited. Do pooja. Performing poojas are procedures done as per family traditions and many books are available in stores as to how to perform the pooja. The slokas can be googled and books are available in stores as well. 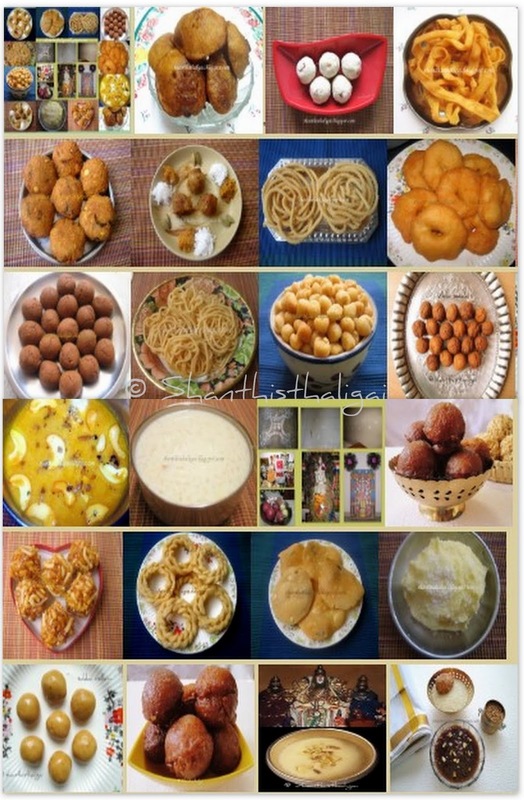 Apart from Pandigai thaligai, various bakshanams are made for offerings, out of which, aval mixed with grated coconut and jaggery, Navaneetham, uppu seedai and vella seedai, payasam and sukku vellam are considered important as these are Krishna's favourites. Offer all the neivedhyams after doing pooja, finally take aarathi. Do punarpooja the next day with a payasam. மிகமிக சுவாரஸ்யமாக எழுதியிருக்கிறீர்கள். வெறும் செய்முறைக் குறிப்பு எழுதுவதுடன் நிற்காமல், பெருமாளுக்கு எப்படி அலங்காரம் செய்வது, எப்படி பூஜை அறையில் எல்லாவற்றையும் வைப்பது என்று வெகு அழகாகச் சொல்லியிருக்கிறீர்கள். சூப்பர்! Shanti akka tried bakshanams based on your recipe, it came out very well.